Agaric jelly made from seaweed makes grape flavor very well. Sugar which we did not stick to is too sweet. When eating in a bite, it feels very nice filled with sweet grape taste that spreads with each chew. 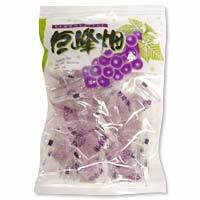 The flavor of grape is especially well suited to this kanten jelly, made from seaweed. Dusted in sugar to hold back the stickiness, yet not overly sweet. When you put one of these smooth, bite-size sweets into youｒ mouth, your taste buds will dance for joy and leave you craving for more.